Looking for somewhere to escape the light pollution and discover the stars? 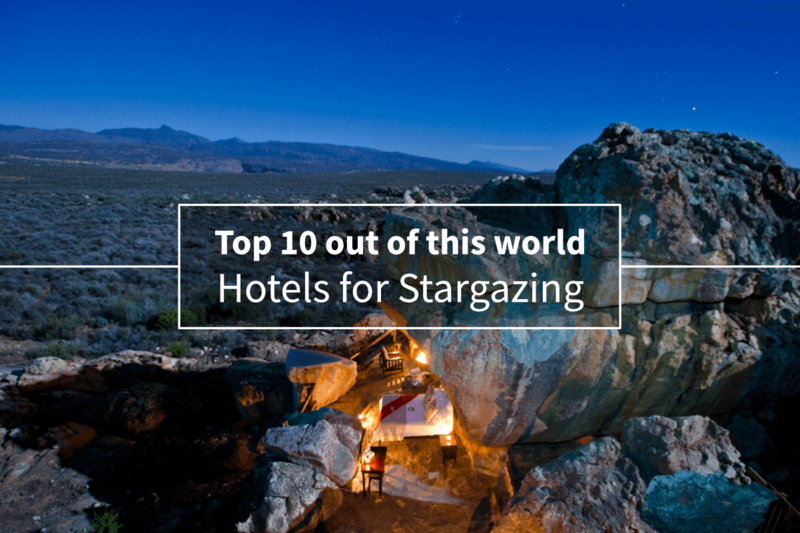 We’ve compiled a top 10 list of hotels with incredible views of the night sky, whether it’s an island in the middle of the ocean or an observatory hotel high up in the mountains. These hotels give you the best seats in the house! Highlights – Sky view from bedroom and bath, dining with the stars. Away from the light pollution of cities, surrounded only by the Indian Ocean. The pool villas provide a perfect view of the night sky from your bed, pool or whilst you have a soak in your freestanding bath. Highlights – Mountain top view from your bed, sauna with view of stars. This venue is less about the view and more about escaping the city. With a rustic, gardening theme, you will feel like you’re transported to the lush green countryside… Until you see the iconic architecture of “the Gherkin” and other London landmarks on the skyline. They also use the food that they grow in their menu! Bedroom ceiling sky view and a stylish, modern design. A luxury retreat located in the tranquility of the vineyards of Southern Portugal, with a Michelin star restaurant and spa on site. The star suites are equipped with a window in the ceiling, meaning you can lie down and spot the constellations whilst you drift off to sleep. Enjoy spectacular sunsets and views of the stars from your infinity pool, or dine out on the balcony surrounded by the natural beauty of the Thai coastline. Star bath?! And open air dining and bedroom. The Santuary Baines’ Camp gives you an incredible view of the African skies, bordering the Moremi Game Reserve. Set in a grove of trees, this is a truly wild stargazing experience with the added bonus of being able to walk with elephants in the day time too. Northern lights and unique themed rooms. Hotel Rangá is the perfect location to see the stars and the wonders of the Northern Lights. It also features themed rooms based on each continent of the world from North America to Asia. An added bonus is that it’s the perfect location for trips to some of Iceland’s volcanos, waterfalls and glaciers too! Pods with an openable ceiling, zero light pollution, observatory on-site. With 7 “geodisc domes” and 4 observatory cabins set in the Elqui Valley, not to mention an astronomical observatory, you’ll feel like you’re in a colony on Mars. The domes are equipped with a private bathroom and living room, with the option to uncover the roof and gaze at the skies. No walls or ceilings to block your view of the stars. Nestled high in the Cederberg mountains, the Kagga Kamma “Star Suite” is the ultimate outdoor hotel experience. Watch the stars pass by from your bed in the middle of a South African nature reserve. You’ll by no means be roughing it though, with a private rock pool and “star bath” part of your ‘room’ in the mountain side. Closer to the stars at 3,100 metres above Sea-level. Journey high into the mountains via railway, through swiss pines and alpine pastures up to the ultimate stargazing hotel. Equipped with rooms that off undisturbed views of the mountain peaks, glaciers and of course, stars. The Gornergrat planetarium is also a great way to learn a bit more about those shiny objects in night sky. An arctic wonderland with some of the best views of the stars and Northern Lights. Located in one of the best places in the world to see the Northern Lights, the Kakslauttanen Arctic Resort provides unparalleled views of the incredible phenomenon for 8 months of the year. You also have the choice of a glass igloo or the more premium kelo-glass igloos which combine the luxury of a wooden chalet with the incredible sky views of a glass igloo. These also come with a private sauna, kitchenette and fireplace. This presentation was brought to you by SkyLine Design UK, suppliers of premium quality all weather outdoor furniture and lighting option.